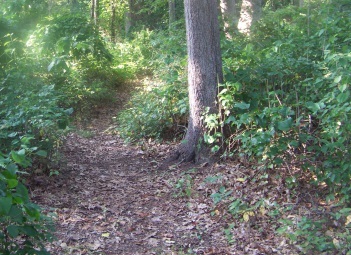 The hiking trails of the Weir River Woods are located in a section of Hull originally known as Jones Island. In the 1930's this area was used to build the George Washington Blvd. This was an alternate route to Paragon Park. The area then became known as Rockaway Annex. Annex meaning extension or addition, Rockaway is one of the many neighborhood names of Hull. 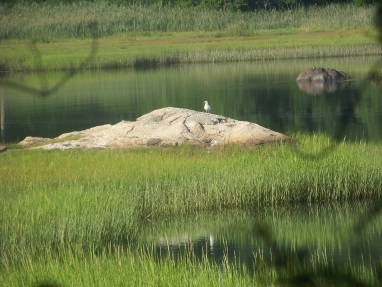 Part of what makes the wooded area special is the estuary it runs along. 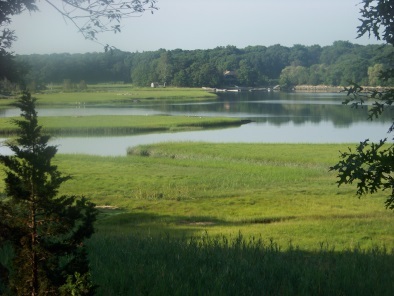 An estuary is a partly enclosed coastal body of brackish water (sea water that gets mixed with fresh water) with one or more rivers or streams flowing into it, and with a free connection to the open sea. 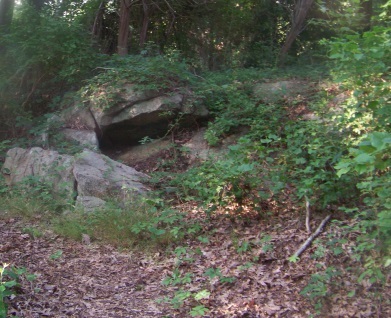 The woods that make up this area of hiking trails are neatly hidden away in a small neighborhood off George Washington Blvd. just as you enter the peninsula that makes up the town of Hull. Just after crossing the bridge over the Weir River, Barnstable and Salisbury Sts. will be on the left. 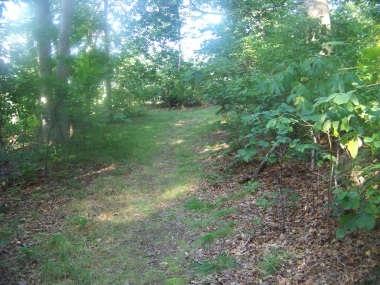 Taking Barnstable and another left on Chatham St. will bring you to the informal looking entrance to the woods. There isn't much to mark this as a parking lot except the logs in place to mark where cars should park and a sign that says not to park on the street. Here to the side and a bit hidden, you will find a kiosk with a map and info about Weir Woods from the Hull and Conservation Trust. There is parking on a grassy lot for about 3 vehicles. The hiking trail into the woods starts just past the kiosk. In the summer you will find raspberry bushes. Deeper in the woods blueberries and grape vines grow as well. While hiking here won't give you a very lengthy nor rigorous work out the woods certainly are interesting! The access path down to the main portion is short with some partial tree blow downs from past winters that make it appear like someone had tried to build some sort of shelter. One of many interesting rock formations in weir river woods. The trail connects and makes a "T" with a wider access main trail. For a full circuit journey of this woodland wonderland I went left at the main hiking trail. Following down this trail there will be a large rock on the right. Most of the growth in this forest is low growing, so if you look to the right you will get a preview glimpse of stairs up a cliff like boulder. The trail will pass through an area that gets a bit rough and most likely in the spring contains lots of standing water. 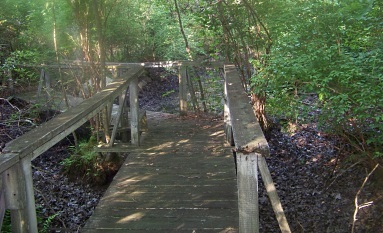 At about 1/10 mile of the journey the trail turns right and will bring you to a bridge over a vernal pond . The wide path appears to intersect and continue but it fades away and ends at some private properties. 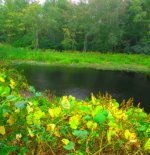 Vernal ponds are not true ponds. They do not have a source of water keeping them full year round. Usually they are just a low area that fills up with water after the winter. They are important because there are several woodland creatures that use these pools of water as breeding grounds in the spring. In season you may find blueberries on the bushes while crossing the bridge. Once over the bridge a wall like ledge lines the hiking trail to the left. This has the feel of walking through a garden. 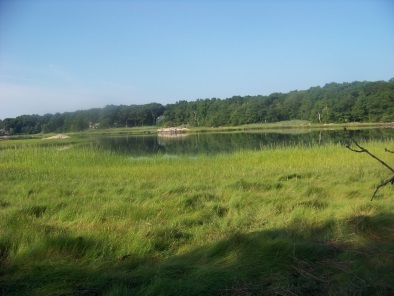 The vernal pond though mostly dry in the summer still leaves the area moist helping keep the area lush. On the ledge lichen and Christmas ferns thrive. Soon you will come upon the stairs seen through the woods. These lead up the ledge to the left. The material making up the stairs are railroad ties and in wet weather may be slippery, so caution is needed! At the top of this climb you will find a bench, though it may be in not cleared out enough to be inviting enough to sit on, it is sturdy. 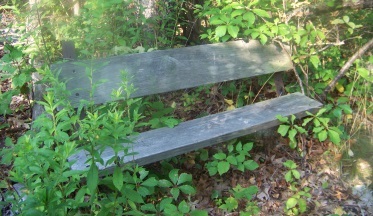 There are many benches in the woods but several are in disrepair. The trail continues on, deeper into the woods. Soon after the climb you will find yourself at an intersection. Before the climb up the stairs you may notice that the trail below continues straight. This trail intersection is where that lower trail will lead you. Continuing straight and another short distance will find you at another intersection. Looking down the trail to the left you will find a large oak tree with a Holly standing right next to it. This trail fades off and becomes full of thorns and briar. Continuing to the right the trail now passes over large boulders on the trail. In wet weather these can be slippery. This portion of the trail leads down to Weir River Estuary. Along the way there are faint trails (animal trails?). Again the forest growth is low and you can see into the woods. Can't help thinking this area would be great for an additional loop hiking trail added to the existing ones. The trail will past some large oak trees and a large mossy area. 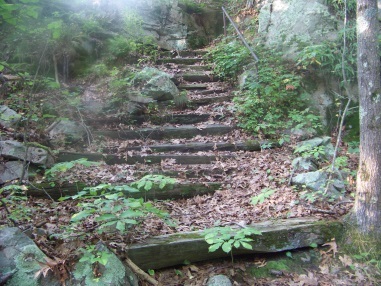 At about 1/3 mile of the journey the trail narrows and starts a slight descent. 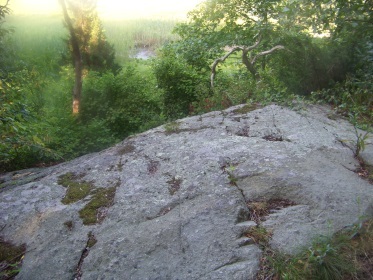 There will be a short side trail to the left to a rocky out look with the first view of Weir River and it's estuary. Just after this side trail the main trail splits. Going to the left will bring you back to the main trail close to the access trail. The full circuit trail goes to the left here. This will bring you through a grassy area and connect with the far end of the main trail through the weir woods. Going left here to follow to it's far end terminus, there is a downed tree that almost acts like a border. After this tree is the Weir River portion of the hike. There will be several side trails that take you out to the river marsh grass edge. The main trail will narrow as it come out to the river. It travels behind a cedar and two canoes at the edge that are in disrepair are a highly visible marker to the area. 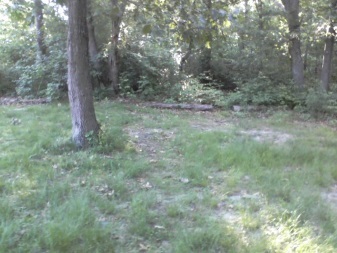 Shortly after, the trail lets out onto the river grass that looks like it has been cut to form the trail. It is littered with the remains of small crabs shells and several horseshoe crabs. Here and there you will find a wooden plank as well. The trail leads out to a rocky point where the river passes through a narrow channel and the water seems to swirl here. My thoughts were that this would be a great place to disembark from a kayak to do a paddle/hike adventure! There is a bit of a pool and beach next to the rocky ledge to use to pull out a kayak. To complete the circuit, follow the trail back into the woods over the fallen tree border and up the main wide trail which will lead back to the access path to the parking lot. This full circuit was 3/4 miles. Many birds gather along these shores! from route 3 exit 14 follow route 228 north. Follow for several miles through the lighted intersection at Free and High Sts. Once through part of the historic section route 228 takes a deep right. Go straight here onto Central St. Follow to the end taking a right into Hingham center. This will bring you out to route 3A. Take a right leading into a rotary. Take the 2nd st in the rotary (summer st). This main road will take a left and become George Washington Blvd. It will pass over the Weir river and just after take the left on Barnstable Rd. Salisbury Rd is more visible here. Shortly up this narrow road is Chatham st. Take the left here and the parking lot will be on the left.